Pomegranates are among the healthiest fruits on earth. They contain a range of beneficial plant compounds, unrivaled by other foods. Many studies have shown that they have incredible benefits for your body, and may lower the risk of all sorts of diseases (1). The pomegranate, or Punica granatum, is a shrub that produces a red fruit (1). Categorized as a berry, the pomegranate fruit is about 5-12 cm (2-5 inches) in diameter. It is red, round and looks kind of like a red apple with a flower-shaped stem. The arils are what people eat, either raw or processed into pomegranate juice. 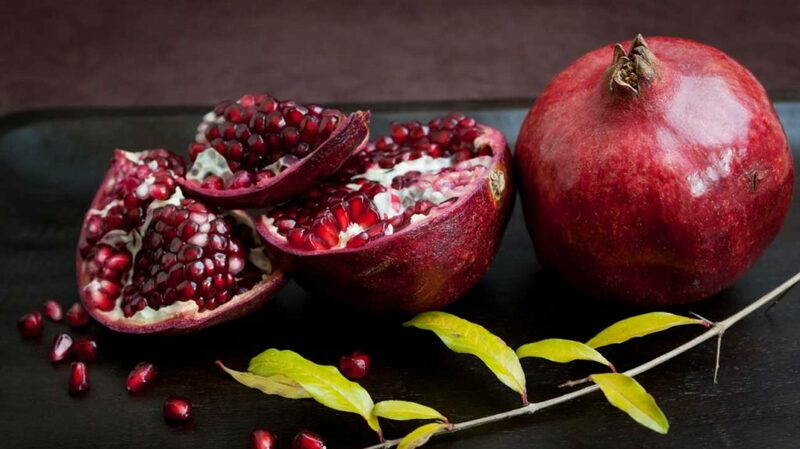 The pomegranate arils (seeds) are also very sweet, with one cup containing 24 grams of sugar, and 144 calories. However, where pomegranates really shine is in their content of powerful plant compounds, some of which have potent medicinal properties. BOTTOM LINE:The pomegranate is a fruit that contains hundreds of edible seeds called arils. They are rich in fiber, vitamins, minerals and bioactive plant compounds, but they also contain some sugar. Punicalagins are extremely powerful antioxidants found in the juice and peel of a pomegranate. They are so powerful that pomegranate juice has been found to have three times the antioxidant activity of red wine and green tea (3). Punicic acid, also known as pomegranate seed oil, is the main fatty acid in the arils. It is a type of conjugated linoleic acid with potent biological effects. BOTTOM LINE:Pomegranates contain punicalagins and punicic acid, unique substances that are responsible for most of their health benefits. Chronic inflammation is among the leading drivers of many killer diseases. This includes heart disease, cancer, type 2 diabetes, Alzheimer’s disease and even obesity. Test tube studies have shown that it can reduce inflammatory activity in the digestive tract, as well as in breast cancer and colon cancer cells (4, 5, 6). One study in diabetics found that 250 ml of pomegranate juice per day for 12 weeks lowered the inflammatory markers CRP and interleukin-6 by 32% and 30%, respectively (7). BOTTOM LINE:The punicalagins in pomegranate juice have been shown to reduce inflammation, one of the leading drivers of many killer diseases. Laboratory studies have shown that pomegranate extract can slow down cancer cell reproduction, and even induce apoptosis (cell death) in cancer cells (8, 9). The PSA (prostate specific antigen) is a blood marker for prostate cancer. Men whose PSA levels double in a short period of time are at increased risk of death from prostate cancer. Interestingly, a human study found that 237 ml (8 oz) of pomegranate juice per day increased the PSA doubling time from 15 months to 54 months, which is huge (10). BOTTOM LINE:There is preliminary evidence that pomegranate juice can be useful in men with prostate cancer, potentially inhibiting cancer growth and lowering the risk of death. Pomegranate extract has been shown to inhibit reproduction of breast cancer cells, and may even kill some of them (12, 13, 14). However, this is currently limited to laboratory studies. More research is needed. BOTTOM LINE:Laboratory studies have shown that pomegranate extract can help fight breast cancer cells, but human studies are needed to confirm this. In one study, people with high blood pressure had a significant reduction after consuming 150 ml (5 oz) of pomegranate juice daily for 2 weeks (15). Other studies have found similar effects, especially for systolic blood pressure (the higher number in a blood pressure reading) (16, 17). BOTTOM LINE:Regular intake of pomegranate juice has been shown to lower blood pressure levels in as little as 2 weeks. There are many different types, but most of them involve some form of inflammation in the joints. Interestingly, laboratory studies have shown that pomegranate extract can block enzymes that are known to damage joints in people with osteoarthritis (18, 19). It has also been shown to be beneficial against arthritis in mice, but there is very little evidence in humans so far (20, 21). BOTTOM LINE:Studies in animals and isolated cells have shown that pomegranate extract may be beneficial against several forms of arthritis, but human research is needed. Heart disease is currently the world’s most common cause of premature death (22). It is a complicated disease, driven by many different factors. In a study in 51 people with high cholesterol and triglycerides, 800 milligrams of pomegranate seed oil per day for 4 weeks was shown to significantly lower triglycerides and improve the triglyceride:HDL ratio(23). Another study looked at the effects of pomegranate juice in people with type 2 diabetes and high cholesterol. They noted significant reductions in LDL cholesterol, as well as other improvements (24). Pomegranate juice has also been shown, in both animal and human studies, to protect the LDL cholesterol particles from oxidation, one of the key steps in the pathway towards heart disease (25, 26, 27, 28). BOTTOM LINE:Several human studies have shown that pomegranate can have benefits against heart disease. It improves the cholesterol profile and protects LDL cholesterol from oxidative damage. Pomegranate juice has been shown to be beneficial in increasing blood flow and erectile response in rabbits (29). In a study of 53 men with erectile dysfunction, pomegranate appeared to have some benefit, but it was not statistically significant (30). BOTTOM LINE:Pomegranate juice has been linked to reduced symptoms of erectile dysfunction, but more research is needed. The plant compounds in pomegranate can help fight harmful microorganisms (31). For example, they have been shown to be beneficial against some types of bacteria, as well as the yeast Candida albicans (32, 33). The anti-bacterial and anti-fungal effects may also be protective against infections and inflammation in the mouth. This includes conditions like gingivitis, periodontitis and denture stomatitis (34, 35). BOTTOM LINE:Pomegranate has anti-bacterial and anti-viral properties, which may be useful against common diseases of the gums. In one study in surgical patients, 2 grams of pomegranate extract prevented deficits in memory after the surgery (36). Another study in 28 elderly individuals with memory complaints found that 237 ml (8 oz) of pomegranate juice per day significantly improved markers of verbal and visual memory (37). There is also some evidence from studies in mice that pomegranate can help fight Alzheimer’s disease (38). BOTTOM LINE:Some evidence shows that pomegranate can improve memory in the elderly and post-surgery, and studies in mice suggest that it can protect against Alzheimer’s disease. In a study of 19 athletes running on a treadmill, 1 gram of pomegranate extract 30 minutes before exercise significantly enhanced blood flow (39). This led to a delay in the onset of fatigue, and an increase in exercise efficiency. More studies are needed, but it seems like pomegranate may be beneficial for physical performance, similar to beetroot juice. If you want to enjoy the health benefits outlined in the article, then you can either eat the pomegranate arils directly, or drink pomegranate juice. At the end of the day, pomegranates are among the healthiest foods on the planet. They have wide-ranging benefits, and may help reduce the risk of all sorts of serious diseases.